We saw the iYo YOYO (pictured above) and memories of our childhood came rushing back, yoyos are versatile toys; you can walk the dog, go around the world and now you can even charge you iPod or iPhone with one. 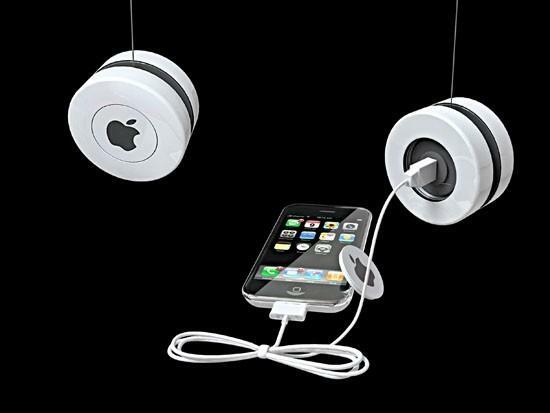 The Swedish designer Peter Thuvander has taken your average yoyo added a little Apple style (i.e. made it white and simple) and placed a small lithium-ion battery inside. Through the act of playing with the iYo the internal lithium-ion battery is charged which in turn charges your device. Simple concept but is a fun twist on green energy, if you have a child give it to them and voila, free energy. The iYo YOYO is still in concept but when it hits the market we look forward to getting our hands on one, it certainly beats charging your iPod with an Orange. 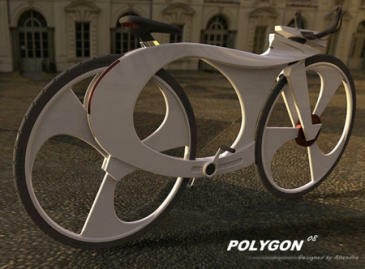 The Polygon bike lets you plug your iPod in and charge it as you cycle. It looks very futuristic but unlike the buttons on the Enterprise, the Polygon is more than just for looks. There are handy buttons on the handle bars so once you stick your iPod in the bike-dock you have full control over the iPod without having to move your hands away from the all important steering mechanism. Some other neat features are the integrated locking system so your iPod won’t fall out and the location of the headphone jack means the wires won’t get in the way.